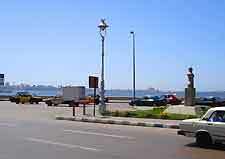 Travelling to Alexandria is straightforward, with most visitors arriving in Cairo by air and then transferring to Alexandria by train or domestic flight. Alternatively, visitors can fly into one of Alexandria's two airports, although this may be more costly. The city is also accessible by using bus transport to travel from some neighbouring countries. 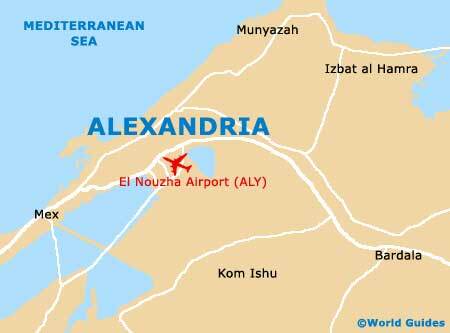 Situated 7 km / 4 miles from Alexandria, El Nouzha Airport (ALY) is the most convenient air gateway to the city. The airport has two runways and limited facilities. Airlines serving the airport include EgyptAir, British Airways, Emirates and Lufthansa. There are direct flights to the following international cities: Vienna, London, Dubai and Frankfurt, while regular domestic flights serve Cairo. Taxis are available for transfers into the city. Alternatively, visitors can arrive at Borg El Arab Airport (HBE), 25 km / 16 miles from Alexandria. This is a smaller airport serving British Airways, Emirates and Lufthansa. Flights connect the city with London, Addis Ababa, Dubai and Frankfurt. Transport into the city is limited to taxis, which are readily available and travel to most areas for a reasonable price, although you should always be clear about how much you are prepared to pay. Cairo International Airport (CAI) is a convenient alternative to flying into Alexandria directly, and offers a greater choice of flights. With the low cost of petrol in Egypt, renting a car can be a very economical way to travel around. Car rental transport companies require you to be at least 25 years old, and there are international rental firms located at the airport and in Alexandria city centre. Driving can be a bit erratic, so exercise extreme caution until you are familiar with Egyptian driving etiquette. Book your Alexandria Car Rental here. The city can be accessed by bus from a number of neighbouring countries, including Jordan and Israel. Journeys can be long and uncomfortable, but tickets are generally very cheap. Inner-city bus transport is not very tourist friendly, with most people preferring to use taxis. 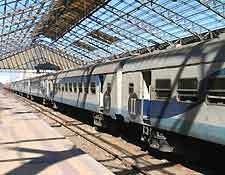 Egyptian National Railways operates all trains in Egypt. 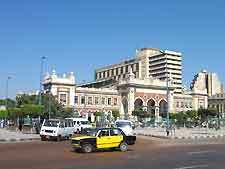 Trains can be caught from Ramses Station in Cairo and travel to the main train station in Alexandria. Tickets can be bought on the day of departure from the railway station. Some first-class or sleeper trains must be paid for in foreign currency. For a small commission, local travel agents can also arrange your tickets for you. Visitors are recommended to travel first or second-class.